Enriched with Dead Sea Mud & Minerals. Restorative and Rich for Replenishing your Hair. 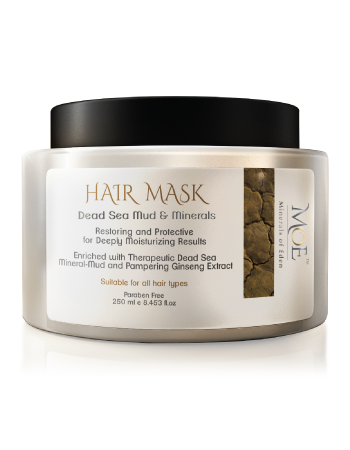 Applied twice a week, this advanced formula hair mask will work its Dead-Sea magic deep into the hair shaft. Formulated with therapeutic mud and 26 natural minerals, this is an intense and enriching experience for your hair. Restore heat-damaged and chemically treated hair with this mineral-oil rich blend which builds up healthy protein strands to replenish and restore your hair leaving it full of life and shine. Regular use of this hair mask will protect your hair from the environment and strengthen it from the roots. Water (Aqua), Cetyl Alcohol, Isopropyl Myristate, Behenyl Trimethyl Ammonium Chloride, Glycerin, Dimethicone, Phenoxyethanol, Ethylhexylglycerin, Cyclomethicone, Dimethiconol, Cetrimonium Chloride, Polyquaternium-7, Silt (Dead Sea Mud), Macadamia Ternifolia Seed Oil, Argania Spinosa Kernal Oil, Sea Salt (Maris Sal/Dead Sea Salt), Hippophae Rhamnoides Oil, Tocopheryl Acetate, Butyrospermum Parkii (Shea Butter), Panax Ginseng Roots Extract ,Linum Usitatissimum (Linseed) Seed Oil, Anthemis Nobilis (Chamomile) Flower Extract, Fragrance, Polyquaternium 10, Glyceryl Stearate, Panthenol, Citric Acid. For a deep restorative nourishing treatment once or twice a week, First use the MoE Shampoo and then apply the mask generously from your scalp throughout the hair shaft including the hair tips. For best results apply to dry hair after shampooing and leave on for at least 15 minutes, or overnight, then rinse off thoroughly in warm water. This mineral hair mask is incredibly good and smells amazing! My split ends are all gone now, really recommended! A cure that delivers what it promises. Feels really good for both hair and scalp! I'm having problems growing my thin hair long. After using this regularly for the last 8 months my hair is now longer than it ever been in a long time - AND it looks good!